The Tesla Model S is one of the hottest luxury cars on the market. Unfortunately, CPO examples have not been available to the public, until now. Carvana.com, an online auto dealership based in Phoenix AZ and operates out of Atlanta, GA has acquired the first ever certified pre-owned Tesla Model S for sale in the United States. It is a 2013 P85 with 6,708 miles. Current list price is 88k before taxes and fees. 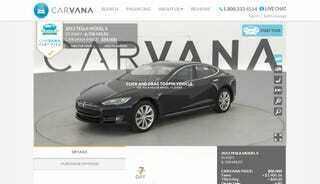 Carvana can deliver the Model S anywhere in the United States for a fee. "We're excited to offer the first certified pre-owned Tesla that is available for sale and delivery nationwide", says Ernie Garcia, President of Carvana. Tesla Motors does yet not have updated information on their site as to the details of the Model S CPO program. The reason being that Tesla is not currently offering a CPO program for the Model S.
"100-day or 4,189 mile bumper-to-bumper warranty and a 7-day "test own" return policy." Given that information I'm going to render a verdict of Crack Pipe. Sorry folks. I was pretty excited about this one, hoping that this would be the start of CPO Model S cars into the market. Perhaps Telsa will find a way to increase their dealer network so that they can offer quality pre-owned vehicles.